This element focuses on creating an open and safe environment and stimulates own responsibility. In an open organization, a constructive dialog between management and employee exist. Another characteristic is that employees enjoy going to their work. Organizations embracing the Lean method stop using the Top-Down approach and follow the Lean Leadership model of the inverted pyramid. These organizations implemented a Bottom-Up approach to mobilize the entire capacity of the work personnel. 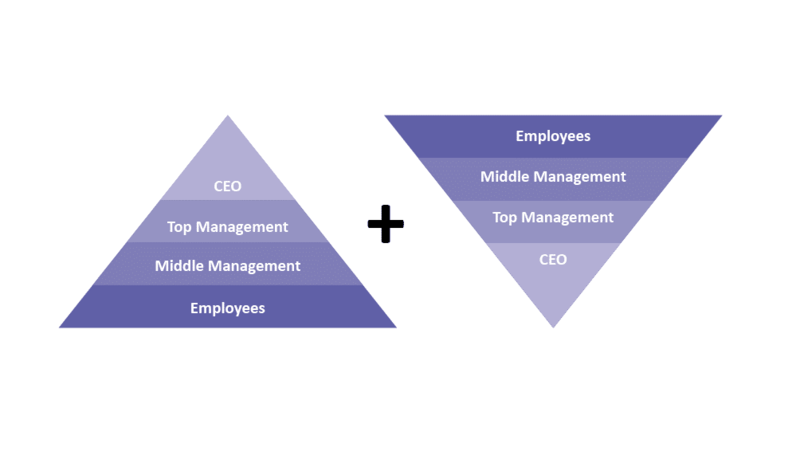 The inverted pyramid is metaphorical for the reversal of the traditional management structure. Employees closest to customers or operational processes are placed at the top and management at the bottom. The personnel working in the production are empowered with a greater decision-making power and freedom of action. The manager’s function changes into a role of facilitating and coaching. This Bottom-Up approach will improve the flexibility and productivity for problem solving, especially for the ‘low-hanging fruit’ projects where there is no necessity for the involvement of higher management to identify and implementing solutions. The day to day problem is solved by the employees experiencing them. It is in their own interest to solve these problems, for it makes their lives easier. The work floor employees have the creativity and ideas to solve such problems, but in traditional management, they are not involved or encouraged to do so. • Employees enjoy going to work. • Employees are involved in the most important decisions and projects. • The organization forms an open and safe work environment for employees. • Results are measurable and are continuously monitored. • The organization is result-oriented instead of task-oriented.